Your fingerprint is a more valuable security resource than your password—you can change a password, after all. So it’s worrying to hear that Samsung’s Galaxy S5 contains a vulnerability that could leave your fingerprint wide open for hackers to clone. 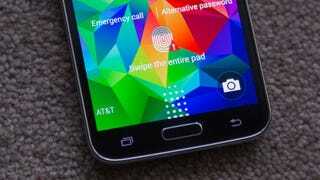 [A]n attacker could focus on collecting data coming from the Android devices’ fingerprint sensors rather than trying to break into the trusted zone... Any hacker who can acquire user-level access and can run a program as root, the lowest level of access on computers and smartphones, can easily collect fingerprint information from the affected Android phones... On the Samsung Galaxy S5, they wouldn’t need to go as deep, with malware needing only system-level access.